There was a time change today. Even though the clock says it’s 11:07pm right now, my body feels like it’s 12:07am. If this time change disappoints you, I recommend thinking of it this way: You’re not losing an hour, you’re gaining 23. I downloaded my first purchased app for my iPod touch this morning. Air Video streams videos straight to your iPhone / iPod Touch, and converts them on-the-fly. Every video I’ve tried so far streams with no problems. I used to have to convert videos with Handbreak (a pretty great program), download them to the iPod, and was then able to watch them (I can hook my iPod up to the big screen in the living room directly). Now I can just stream movies directly to the TV through my iPod. It’s totally worth the $2.99 price tag! Alternatively, you can get the free version, which works great too, it’s just harder to browse your files. When I read Douglas Adams’ The Salmon of Doubt, I really liked his take on the phrase “it turns out” and have attempted to incorporate it into my lexicon. Here’s a great little blog post from jsomers.net on the usefulness of the sneaky phrase, “it turns out“. If the road to Hell is paved with good intentions, what is the road to heaven paved with? It’s currently -38Â°C in Lethbridge. That’s -36Â°F. Only a little colder and then numbers for Celsius and Fahrenheit converge. Oh and did I mention that’s WITHOUT the wind chill factor. Yeah, with wind chill it’s more like -47Â°C! Articles on the Internet sometimes feature a “spoiler warning” to alert readers to spoilers in the text, which they may then choose to avoid reading. Wikipedia has previously included such warnings in some articles on works of fiction. Since it is generally expected that the subjects of our articles will be covered in detail, such warnings are considered unnecessary. Therefore, Wikipedia no longer carries spoiler warnings, except for the content disclaimer and section headings (such as “Plot” or “Ending”) which imply the presence of spoilers. It makes complete sense, but this policy change is something I would have liked to know BEFORE I read the plot summary of The Road, a novel I WAS looking forward to reading. A seventh grade student, BridgeAnne d’Avignon, and her 80 year old grandfather traced President Obama’s ancestry back to a common relative with most of the other presidents. They’re all related to the former King of England from 1199 to 1216, John “Lackland” Plantagenet. You may remember John “Lackland” Plantagenet, or John of England from the characterization in Disney’s Robin Hood. 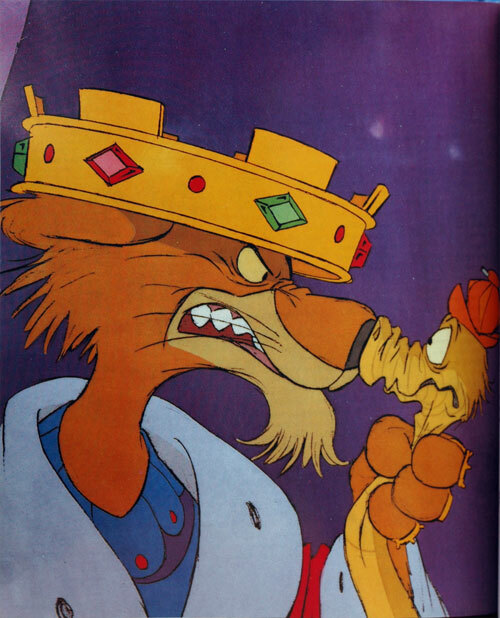 Prince John and Sir Hiss as scanned from page 166 of The Illusion of Life Disney Animation by Frank Thomas and Ollie Johnston. Yes, THAT Prince John. Aha. According to BridgeAnne, the only former US president that does not share John “Lackland” Plantagenet as an ancestor is Martin Van Buren. Foursquare is the iPhone app that rewards social behaviour. Itâ€™s not out yet, but according to The New York Observer, it should be available in time for SXSW. So, a video game that rewards being adventurous and outgoing in, you know, real life? Kottke is calling it the new Dodgeball. One significant change I’m wondering about, will it work in Canada?